The rapidly declining cost of persistent RAM technologies prompts the question of when, not whether, such memory will become the preferred storage medium for many computers. In anticipation of that development, we present Conquest, a file system that provides a transition from disk to persistent RAM as the primary storage medium. Conquest is incrementally deployable and realizes most of the benefits of persistent RAM as it becomes cheaply abundant. As of October 2001, Conquest can be used effectively for a hardware cost of below $200. We compare Conquest's performance to ext2, reiserfs, SGI XFS, and ramfs, using popular benchmarks. Our measurements show that Conquest incurs little overhead compared to ramfs. Compared to disk-based file systems, Conquest achieves 24% to 1900% faster performance for working sets that fit in memory, and 43% to 96% faster performance with working sets larger than the memory size. Conquest uses memory to store all metadata, small files (currently based on a size threshold), executables, and shared libraries, leaving only the content of large files on disk. All accesses to in-core data and metadata incur no data duplication or disk-related overhead, and executions are in-place. For the large-file-only disk storage, we use a larger access granularity to reduce the seek-time overhead. Because most accesses to large files are sequential, we can relax many historical disk design constraints, such as complex layout heuristics intended to reduce fragmentation or average seek times. An-I Andy Wang, Geoffrey H. Kuenning, Peter Reiher, Gerald J. Popek. Work-in-Progress Report: Conquest: Better Performance Through a Disk/Persistent-RAM Hybrid File System. On-Line Proceedings of the First USENIX Conference on File and Storage Technologies (FAST), Monterey, January 2002. RuGang Xu. Conquest: Combining Battery-Backed RAM and Threshold-Based Storage Scheme to Conserve Power. Presented at the 19th Symposium on Operating Systems Principles (SOSP), New York, October 2003. Geoffrey H. Kuenning. The Disk is Dead! Long Live the Disk!. Presented at the Computer Science Colloquium, Harvey Mudd College, Claremont, April 2003. An-I Andy Wang. Conquest: Preparing for Life After Disks. Presented at the University of California, Los Angeles, Advanced Operating Systems Lecture, Los Angeles, October 2002. An-I Andy Wang. Conquest: Better Performance Through a Disk/Persistent-RAM Hybrid File System. Presented at the 2002 USENIX Annual Technical Conference, Monterey, June 2002. An-I Andy Wang. The Conquest File System: Life After Disks. Poster presented at the UCLA Computer Science Department Annual Research Review, UCLA, Los Angeles, April 2002. An-I Andy Wang. Conquest: Better Performance Through a Disk/Persistent-RAM Hybrid File System. Presented at the First USENIX Conference on File and Storage Technologies (FAST), Monterey, January 2002. An-I Andy Wang. Conquest: RAM as Storage; Disks as Tapes. Presented at the University of California, Los Angeles, Advanced Operating Systems Lecture, Los Angeles, November 2001. An-I Andy Wang. The Conquest File System: Life after Disks. Poster presented at the UCLA Computer Science Department Annual Research Review, UCLA, Los Angeles, April 2001. An-I Andy Wang. 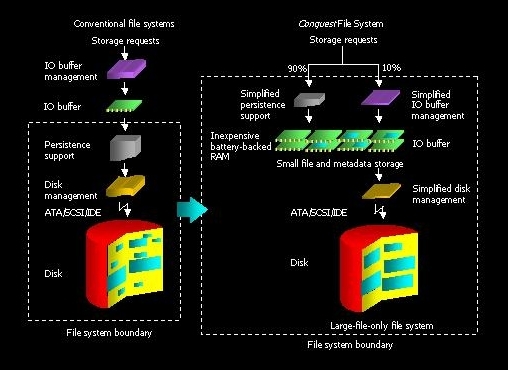 Integration of Memory and File System Services via Persistent RAM. Presented at the Computer Science Colloquium, Harvey Mudd College, Claremont, October 1999. Conquest FS: The Disk is Dead, Slashdot, April 21 2003. Eugenia Loli-Queru. Learning About the Conquest File System, OS News, April 21 2003. Shawn. Not Your Father's File System, hartys.net::the blog, April 21 2003. Baltazar H. DAFS, Conquest May Pave Way for Future File Systems, eWeek, Ziff Davis Media, June 17 2002. Conquest File System. LisoLeg: Linux Source Learning Group, 2000. You are visitor number since November 11, 2001.